Those grips are definitely an upgrade. My well worn Blackhawk has similar stocks, which look way better than the fake ivories it wore for years, but with years of mountain snow, rain, and holster wear, it's not worth an image. I assume those are factory laminant/rose wood grips? They are beautiful. It has been years, but Hogue used to have some interesting, I believe Blackhawk designed, single action grips. Have you looked at these, and your opinion? The only 30 caliber carbine I have ever fired was a vintage M2, and it was friggin (excuse my French) awesome...my first time to shoot a full auto. I have never fired the cartridge in a handgun, but have read that it is the/one of the flattest shooting calibers available for a traditional handgun (revolver/semi-auto). 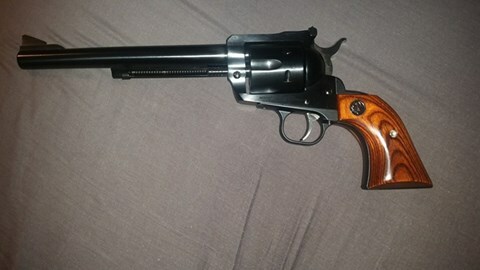 What is your opinion on this, how might it compare with a hot .357 mag.? Sorry, I just love reading about, and discussing this sort of stuff.